Volunteer of the Year is Barbara Kean. 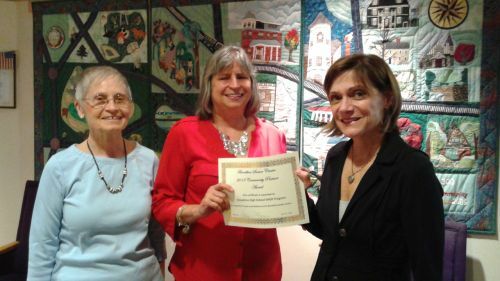 The award was presented at the volunteer lunch. Barbara is an ambassador for us who exemplifies kindness and concern. Commendations also went to Corey Cohen, Frank d’Entremont, Rita d’Entremont, Regina Frawley, Carol Fullerton, Phil Fullerton, Rhona Hirschowitz, Charlotte Millman, Michelle Moshin, Fran Pechenick, Vera Sharma, Eleanor Small, Muriel Stark, David Weinberg, Louise Weinberg, Ada White and Roberta Winitzer. Our community partner of the year is the Brookline High School SHOP program. SHOP is a collaboration between us and the community service group at the school: students helping seniors with shopping along with developing new friendships. Student coordinators are Nick Brown, Shahar Hartman and Roy Golan along with faculty advisor Lisa Gaffey. In March, the SHOP program was featured on Boston 25 NEWS (link to the right). 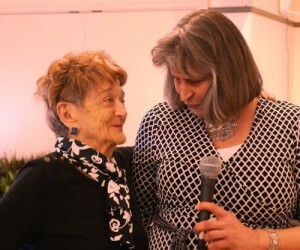 The luncheon was dedicated to the memory of Vivian H. Freeman, a volunteer coordinator for 18 years. 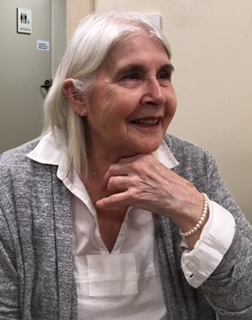 Vivian was a Wellesley College graduate with a master’s in education. Celebrating his one-year anniversary as a volunteer: Daniel Price: Thank you speech (click to listen) We feel he has enriched our lives as much as we have enriched his. Tax identity theft occurs when someone steals your Social Security number to file a fraudulent tax return or to get a job. The computer virus “emotet” sends emails supposedly from the IRS with a fake copy of your return. Once you click, you become vulnerable to hackers. IRS scam calls are more common in season. If the IRS gets a duplicate tax return with your SSN, you get a written notice. The IRS also sends mail if you have unreported income or that you and someone else are claiming the same dependents. The IRS does not initiate contact by email, text or social media. The IRS will not call you unless you first heard from them by mail. The IRS never insists on wired payments, cash or gift cards or prepaid money cards. – – Don’t give our personal information unless you know who is asking. Don’t be shy about refusing. – – Don’t open email attachments that are not from a verified sender. The United Kingdom now has a Minister of Loneliness. Why? Because loneliness and social isolation can contribute to premature death. Social isolation is a challenge for all generations. In the U.S., Dr. Vivek Murthy, former surgeon general, says: “Loneliness places the body in a chronic stress state and increases inflammation, our risk of cardiovascular disease, and other chronic illnesses. The mortality effect associated with loneliness is even similar to the life-shortening we see with smoking 15 cigarettes a day. 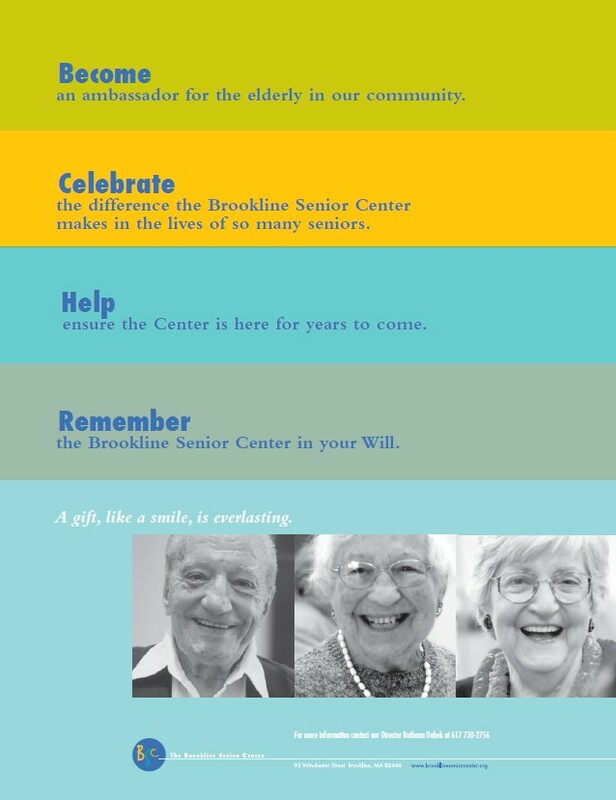 What the Brookline Senior Center is doing and how you can help: We have a long history and commitment to helping you become more engaged with peers and the community. We encourage people to attend activities here. If you’re at home, we offer Library Connections (the library comes to you); friendly visiting; SHOP (groceries to you) and the MY Buddy Program. WHERE WILL YOU BE IN 2030? Is Public Wi-Fi Safe? – Free public Wi-Fi in places like airports or coffee shops is convenient but it can be risky. Scammers monitor network names and set up their own “evil twin” access points hoping your computer or device will connect to it without your consent. Or they launch “man in the middle” attacks, hacking between you and your Wi-Fi- connection. Their goal is grabbing your personal information, email, credit card numbers and passwords. Phone Scams – This year 30% of calls to cell phones are fraud. Landline fraud is declining (but not in my house). Watch area codes. Caller ID shows a local number. Answer if a person you know name shows. On Smartphones, you can block phone numbers call by call. T-Mobile shows likely spam calls (they really do). The FTC is getting reports that people are pretending to be from Social Security who are trying to get your social security number and your money. They may say your number is linked to a crime in Texas involving drugs or sending money out of the country illegally. They’ll tell you your number is blocked and you need to pay to reactivate it or get a new one. He will ask you to confirm your old number. Other variations: they tell you someone used your number to apply for a credit card and you may lose your benefits. Or your bank account is going to be seized, you need to withdraw the money and they’ll keep it safe. SOCIAL SECURITY WILL NEVER CALL to ask for your number or ask you to pay anything. It won’t threaten your benefits. Your caller ID may show their real number: 800. 772. 1213. Computers make it easy to show any number on called ID. Never give your number to anyone who contacts you like this. Do not give a bank account or credit card number – EVER – to anyone calling you. Gift cards – are a popular item that are rife with opportunities for fraud. When buying, make sure the PIN is not showing. Also, “anyone who demands payment by gift card is always,always a scammer,” says Jennifer Leach, assistant director of the FTC’s division of consumer and business education. Fake retail websites – “Any malicious link can be made to look like Amazon.com,” says Experian. Addresses look similar (amazon-shop.com) and are visually identical. If you try to buy, you’re just giving scammers your credit card number. Travel – If a travel offer looks too good to be true, it probably is, says Experian. Fake travel sites are common also.